Meet boy he a white pomeranian. he great with kids and cats. Not so great with chickens, horses, or cattle. Lady has an extremely high drive so he wants to herd all farm animals. She would do best as an only dog as he likes to be the center of attention.Up to date on shots, heart wormer. Not spayed. papers. Rehoming fee applies. 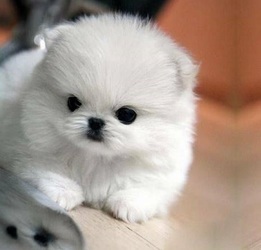 Two lovely Pomeranian puppies available now for Christmas okay.